Enjoy this story of Nano Nagle told by Aberdeen's Presentation Sister Lynn Marie Welbig. Nano Nagle (1718-1784) was born in Ireland, which suffered under oppressive British rule. Their strict penal laws barred Irish children from attending school or learning about God. At age 32, Nano secretly gathered the children of the poor, teaching them catechism, reading, writing and mathematics. As word spread, Nano's hedge schools increased in number, and more teachers were needed. 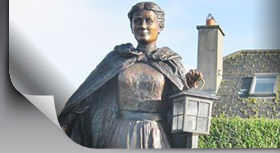 Nano eventually established seven schools in Cork, Ireland. Tireless in service, Nano spent her days teaching the children, and her nights caring for the sick and the elderly, bringing them food, medicine and comfort. Captivated by the spirit of the poor she served, she often visited with them late into the night. Lamp in hand, she'd return home making her way among the winding lanes. Before long, Nano became known as the "Lady of the Lantern."